Foxtel has confirmed the stars that will attend the Logie Awards Red Carpet at The Star. 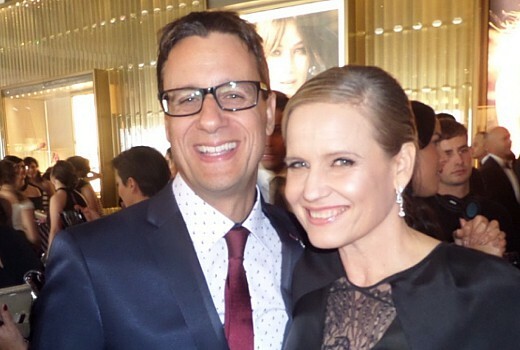 Foxtel has 17 nominations in total including its first ever Gold nominee in Andrew Winter. Winter – who is also up for the Silver Logie for Most Popular Presenter – will attend with his wife Caroline, and fellow presenter, Shaynna Blaze. Selling Houses Australia is vying for Most Popular lifestyle Program. They will be joined by fellow Lifestyle personalities The Great Australian Bake-Off’s Matt Moran and Mel Buttle who have just wrapped their upcoming season. Wentworth’s Kate Atkinson (nominated for Most Outstanding Actress as is Pamela Rabe who is currently overseas) and Celia Ireland (Most Outstanding Supporting Actress) will be joined by Katrina Milosevic, Bernard Curry, Sigrid Thornton, Robbie Magasiva, and Jacquie Brennan. Currently filming its 7th season, the show is in the running for both Most Popular Drama Series and Most Outstanding Drama Series. A Place To Call Home‘s Marta Dusseldorp, Noni Hazlehurst, Brett Climo, Abby Earl, David Berry, Craig Hall, Sara Wiseman, and Tim Draxl – will join Jenni Baird (nominated for Most Outstanding Actress). Aaron Pedersen is nominated for Most Outstanding Supporting Actor but is overseas. The series is again nominated for Most Outstanding Drama, which it won in 2017. Cameras are currently rolling on the last episodes of A Place To Call Home The Final Chapter, which is now confirmed for Sunday, August 19. Also attending are FOX League’s Yvonne Sampson, Justin Hodges, Corey Parker, and Michael Ennis, FOX Footy’s Sarah Jones. Queensland boxer Jeff Horn, Nickelodeon’s Lee Carseldine and Kristy Best, US teen star JoJo Siwa, Geordie Shore’s Chrysten Zenoni, Alex Macpherson, Dee Nguyen, and Nick Murdoch, E Entertainment’s Ksenija Lukich and the Gold Coast’s own, Jessica Green, star of the upcoming Syfy series The Outpost. Absent this year are SKY News and Real Housewives cast.